I am going to share the best salad I’ve ever eaten. My girlfriend Tally made it for me one year, and I’ve been making it ever since. It’s simple – it has only three ingredients, and if you want you can add/change/endlessly make variations on this salad, but there is a trick to it, which I’ll get to later. First, heap a bowl with the best fresh spinach you can find. Then (depending on the number of people you’re having) toss in the best quality sun-dried tomatoes in olive oil – chopped or not, as you like – that you can afford. Add a teaspoon or more of the oil – that’s your dressing. Then sprinkle in a handful of feta cheese, and voila! You have a great salad. These three ingredients, when put together, create a tasty, flavorful, healthy salad that will add to any meal, and is better than ANY salad you can get at any restaurant. It works brilliantly all summer long, as well as in winter. The big trick, though, is the spinach. If you do put in a vegetable garden each year, or think you might want to start, the best bang for your gardening buck will be in herbs. Why? Herbs are the most expensive item to buy, whether you buy fresh or dried. Rosemary and thyme are perennials; they’ll grow year after year as long as you keep them trimmed and watered. Oregano and marjoram, too, as well as others. Basil and parsley are best bought early in the season and put into pots, because as winter comes in they will die off. Buy early and buy often – my first bunches of basil this year died due to the strange fluctuating weather we had in March (soft freezes and then 80 degree temps). This bed, above, has two types of basil at the foreground, then to the left is a baby spinach plant. There are three of them in a row, then two bigger spinach plants from the nursery. We’ve been munching on that for a month now. Beyond that, to the right is some thyme – garlic and onions are in this bed, along with the two big sunflowers at the left and the row of sunflowers also at the right. It’s a motley bed, to be sure! By far the easiest after herbs is spinach. There is nothing – and I mean NOTHING – like fresh-picked spinach. It’s bursting with flavor and vitamins. In general, the deeper the color of your salad greens, the more nutritious it will be (though to be fair there is a place for iceberg lettuce). So your spinach bed (which is truly gratifying to grow from seed, but you’ll be eating better and sooner off of plants from your nursery) can also play host to some lettuce. Again, I grew some from seed – my plants won’t be ready to eat for quite some time, but once they are I’ll be able to harvest leaves from my lettuces all summer long. Seeds don’t cost much, and provide a lot of bounty. Go ahead, experiment. You don’t need much to start a garden – just some dirt, some manure to add to the soil, seeds or plants and water. Voila – you’ve got a garden! Remember though, you’ve gotta get out there and water those seeds every day, twice a day, until they sprout – and then every day, twice a day, until they get big enough to withstand a day without water. When it’s breathtakingly hot, water in the early morning and after the sun has gone down but it’s still light out. Later, you’ll be able to tell by the plant itself if it needs water. But if you think it does – and the soil around it is dry – it probably does. We had a real bad grasshopper problem (one or two grasshoppers in your garden will decimate it). Tom planted garlic all over the place, and then we sprayed with a crushed garlic and mineral oil and water mixture – organic, but the bugs hate it. No grasshoppers for the last few weeks – maybe they’ve gone to bug the neighbors! How about you? Any garden tips? And here’s some apple blossom for you! 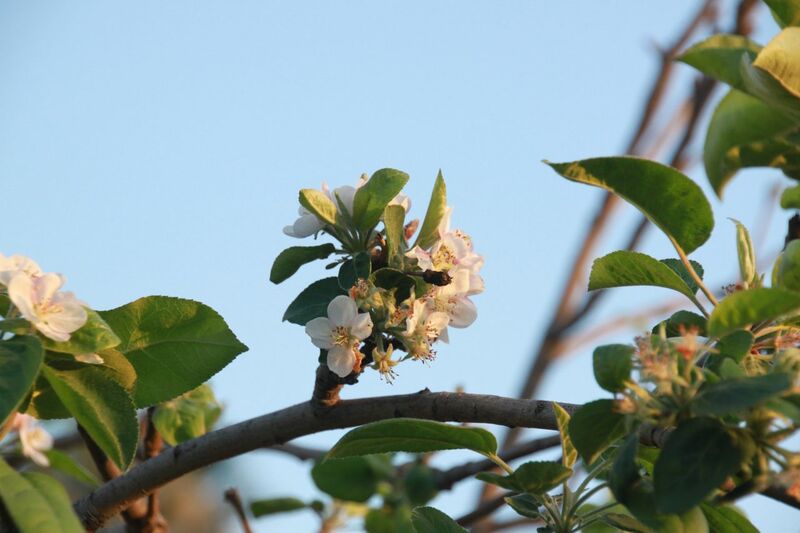 These apple blossoms are now tiny apples! This photo taken 2 weeks ago. Thanks for stopping by – I enjoy talking to you! If you like this post or any others, I’d love it if you would subscribe. The more the merrier! Roben, lots of herbs grow really well indoors. Basil is one – just find a fairly sunny window and you’ll do great! I’m not a gardener, but that salad is right up my tastes. Love it. Hey, Janie. Yeah, this is a terrific salad – enjoy! I am not a fan of salad. However, this salad combines 3 things I really like: spinach, sun-dried tomatoes, and feta cheese. I can see where it might actually have a satisfying taste. Thanks for sharing! Salads are tricky to get right, I agree. Let me know how you like this one. The salad sounds easy and yummy! I love sun-dried tomatoes on just about everything!! Artichokes too, for that matter!! I must make this salad. It sounds like a staple for the summer. It’s too bad I can’t grow anything! Natalie, let me know what you think! I, too, make a spinach-tomato-feta cheese salad. Perfect for the warmer weather. I use Trader Joe’s feta with mediterranean herbs, by the way. Guess I’m a bit lazy about picking my own herbs (though I do grow them). Thanks for the salad reminder! Love your garden entries. Aw, thanks, Sarah!! I may have to do more of those and less wine entries…we shall see! I love gardens but live in an apartment with only a shaded balcony. 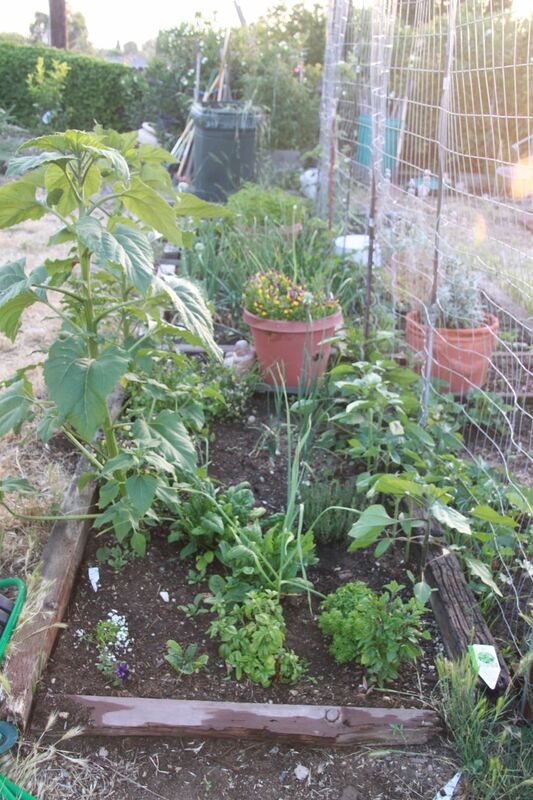 There is simply not enough sun to grow veggies or herbs. My sister just moved and gets to grow tomatoes. I am ever so jealous. Oh well, I’ll just have to go down and steal some produce from her! Maria, you can come hang out in my garden any time! I’ll even let you steal produce! This recipe makes my mouth water just reading it. Thank you! My rosemary is already gorgeous this year, but our summer is running about a month early. And despite our savage winter icy weather, sage is also a good perennial for me, and as long as I keep the errant grass pruned (that tries to horn in because I keep the bed watered), it spreads out bigger and better each year. Thanks again for what’s sure to become my favorite summer dish. D’oh! You’d think I’d remember about sage – I’ve got two different varieties in my garden. And you’re more than welcome, dear!